How many project managers are still laboring with the aftermath of Fredrick Winslow Taylor, more popularly known as F.W. Taylor? You might ask: Who was Taylor? F.W. Taylor was one of the first to study business systematically. He brought 'Taylorism" into the business culture in the years leading up to World War I. By 1915, his ideas were considered quite advanced, and they had significant impact well into the mid-20th century. Taylor was a mechanical engineer who worked early-on in a metal products factory. Appalled at the seemingly disorganized and informal management of the time, and equally distressed by the costly throughput of poorly motivated workers laboring at inefficient processes , Taylor set about to invent "scientific management", a revolutionary movement that proposed the reduction of waste through the careful study of work. Taylor came up with the original 'time-and-motion' studies, perhaps one of the first attacks on non-value work. Peter Drucker, a management guru par excellence who coined the term 'knowledge worker', has ranked Taylor, along with Darwin and Freud, as one of the seminal thinkers of modern times. ["Frederick Taylor, Early Century Management Consultant", The Wall Street Journal Bookshelf, June 13, 1997 pg. A1]. The essence of Taylorism is an antithesis to agile principles but nonetheless instructive. Counter to what we know today, Taylor believed that workers are not capable of understanding the underlying principles and science of their work; they need to be instructed step-by-step what to do and how to do it; and nothing is left to chance or decision. Rigid enforcement is required. However, Taylor was close to the mark with his doctrine about value-adding work. According to Taylor, managers must accept that they have responsibilities to design efficient and effective process and procedures. Waste must be eliminated! Every action requires definition and a means to measure results. Taylor was not well like by workers and it's not hard to see why. But Taylor's ideas and practices brought great efficiencies and profitability while providing customers with products of predictability of quality. Taylor most important legacy is perhaps his ideas of scientific management and the importance of process definition and process management as a means to control product and productivity. I like what Steve McConnell says about quality and the software relationship. Building off Taylor's ideas of 'do it once right', though he does not mention Mr. Taylor, McConnell, author of the respected book "Code Complete" states the " general principle of software quality is .. that improving quality reduces development costs .... the best way to improve productivity is to reduce the time reworking..."
Fredrick Taylor was the first to study and quantify non-value work and put emphasis on eliminating wasteful and time consuming processes, procedures, and environmental impediments. Certainly, the project manager is, or should be, is vested with confidence, good faith, reliance, and trust. So, that makes the PM a fiduciary watching out for the vulnerable. And, in a project situation, who is vulnerable? And, the PM is to hold all their interests in hand and find the best solution that optimizes interests for each of them? Good luck with that! At some point, some ox is going to get gored. And then who blames the fiduciary? And to what risk is the fiduciary held? The answer is: it's different in every project, depending on whether the client or sponsor is most supreme. And, of course, how does the PM get measured? I think this why they pay the PM the big bucks! As a former intelligence professional, John LeCarre is one of my favorite authors, to say nothing of the dry British wit and sparkling prose that supports some quite challenging plots. Nonetheless, I didn't expect to find this wisdom on the pages of "Our kind of traitor"
How do you validate the efficacy of that which is yet to be conceived? Verification: When development is complete, and when integration of all requirements are complete, the roll is called to ensure that every validated requirement is present and accounted for. Placed into an Agile context, validation is applied both to the project backlog and to the iteration backlog, since changes are anticipated to occur. Validation is typically first applied at the story or use case level, validating with conversation among the interested and sponsoring parties that the functionality proposed is valid for the purpose. One can imagine validating against external rules and regulations, perhaps internal standards, and of course validating against the business case. Depending on the project paradigm, V-and-V can be carried into integration tests and customer acceptance tests, again testing against various benchmarks and standards for validity, and verifying that everything delivered at the iteration level got integrated at the deliverable product level. In my view, and what I tell my students: Nonsense, all of it! "They" have never tried to build something with OPM (other people's money) and been personally accountable for how the money is spent, what value is produced, and how the value/cost ratio was managed to the advantage of the business. But even more important, "They" have never had to be responsible for business-critical performance. But to that add external regulators. Regulators don't give a flip about what "They" think. There had better be outcomes that can be audited back to the base level; there had better be documentation that supports claims; there had better be a way to do V&V before the "what did you know when and why didn't you know sooner" questions arrive via your local lawsuit. In any regulated product market, like medical devices for instance that are built with a lot of software, the focus has to be on the joint satisfaction of the buyer/user and the regulator. Fortunately, both of these groups are on the "output" side of the project, which fits Agile quite well. Where agile has a vulnerability is in the compliance part... unless compliance is built into the backlog, either as a framework or as explicit "stories". To not do so is to take a really unrealistic path to only temporary success... temporary until the regulators tear it apart. Same comments apply for any number of regulated businesses, like banking, by the way, and back office areas like cash management and receivables where these things have to sustain audits, to say nothing of safety systems like certain critical avionics, ship controls, and industrial controls. And, in this day and time: "big data". Ever tried to validate a data warehouse with tens of millions of records? The issue is simple; the solution is not. Reporting from a data warehouse is almost like "lying with statistics": you can find some data that fits almost any scenario, but is the context accurate; marriage of data with context is where the complexity (and information) lies. Doing data reports in Agile could be fool's errand if the "stories" are not carefully crafted. Now, to be fair, Mike Cohn more or less supports the thesis we present here when he (Mike) quotes Philip Anderson who writes in "Biology of Business"
Self-organization may deny biases and bully the nemesis off the team. Group think, anyone? You have to give Jurgen Appelo high marks for imaginative illustrations that catch the eye and convey the thought. He says this is one of his best illustrations ever; he may be right. He calls it his "celebration grid". I imagine Jurgen will be telling us a lot more about this if it catches on. “Celebrate failure” is nonsense, because you shouldn’t celebrate failure that comes from mistakes (the red part). 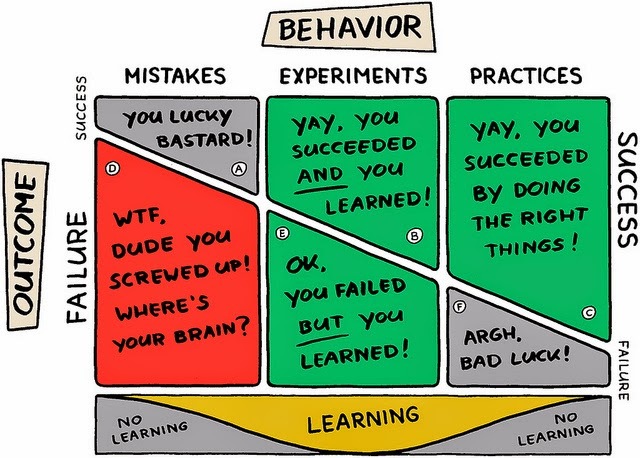 What you should celebrate is learning, and repeating good practices (the green parts). File this under leadership for learning and motivation, change management, managing team dynamics, and carrot and stick. Does software fail, or does it just have faults, or neither? Silly questions? Not really. I've heard them for years. Faults refer to functionality or performance incorrectly specified such that the software is not "fit for use". Thus in the quality sense of "fit for use" it has faults. I don't see an argument for "neither", but perhaps there is one. What’s odder about the views of my correspondent is that, while believing “software cannot fail“, he claims software can have faults. To those of us used to the standard engineering conception of a fault as the cause of a failure, this seems completely uninterpretable: if software can’t fail, then ipso facto it can’t have faults. Furthermore, if you think software can be faulty, but that it can’t fail, then when you want to talk about software reliability, that is, the ability of software to execute conformant to its intended purpose, you somehow have to connect “fault” with that notion of reliability. And that can’t be done. Want a job in "big business", or want to pursue "gigs" with the big guys? The "new" GM will want workers who are highly creative and capable of working autonomously as well as collaboratively. And, did I mention: initiate! 20 odd years ago, Agile was a revolution in methodology and some say a revolution in business objectives, all set down in some now-well-known principles from the last '90s. But, has there not been an evolution in the last two decades? Originally, agile meant valuing individuals and interactions, working software, customer collaboration, and responding to change. Agile was about cross-functional teams working closely together to innovate new products or solutions that couldn’t have been developed any other way. He's probably right on this. For agile to be anything other than a cottage industry, it had to marry up with serious business people who put up the money and expect effective functional results in-line with business objectives. The soft side of agile, the camaraderie of harmonious teams focused on product by and large, when modulated by capitalism, comes out looking like the Cohn view of evolutionary Agile. "Would you tell me, please which way I ought to go from here? 'I don't much care,' said Alice. 'So long as I get SOMEWHERE,' Alice added as an explanation. 'Oh, you're sure to do that,' said the Cat"
- Lewis Carrol from "Alice's Adventures in Wonderland"
Some Agile projects have trouble getting off the stage; to wit: Are we done yet? All Agile projects benefit from some degree of planning and estimating, if only to frame the project onto the right first step. Alice and the Cat are not Agilists! Normally the SPOC for a business development effort. requirements scope with the ACR and CFR to the customer. determine the Delta, and how to fill those Delta. 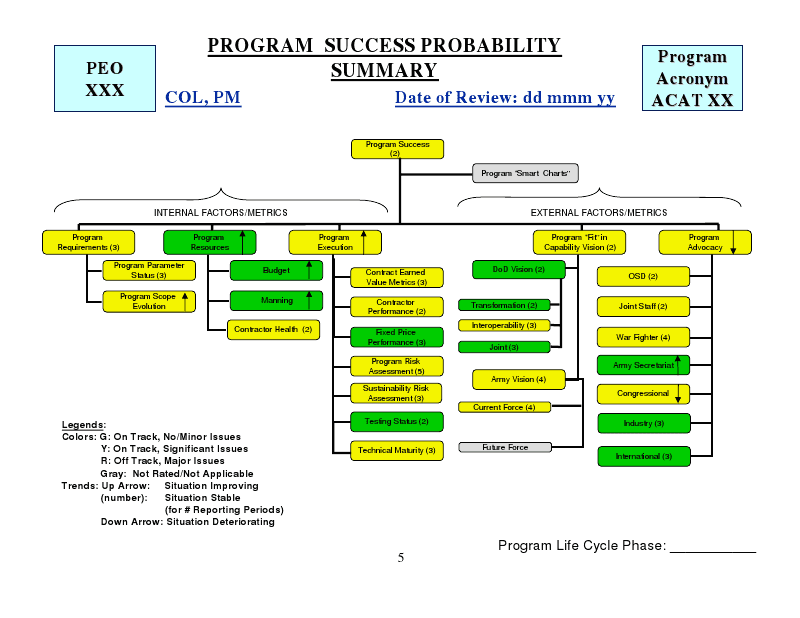 and provide input to the executing team (CFR) for project execution planning. Finished Product Handover to the customer Project/Service Operations team. At this stage the solution ceases to be a project, and is included into the Customer Operational and Support Lifecycle Management. Here's the argument for "it never fails, but has faults": Never fails is as above; faults refer to functionality or performance incorrectly specified such that the software is not "fit for use". Thus in the quality sense of "fit for use" it has faults. What’s odder about the views of my correspondent is that, while believing “software cannot fail“, he claims software can have faults. To those of us used to the standard engineering conception of a fault as the cause of a failure, this seems completely uninterpretable: if software can’t fail, then ipso facto it can’t have faults. Furthermore, if you think software can be faulty, but that it can’t fail, then when you want to talk about software reliability, that is, the ability of software to execute conformant to its intended purpose, you somehow have to connect “fault” with that notion of reliability. And that can’t be done. Here’s an example to show it. Consider deterministic software S with the specification that, on input i, where i is a natural number between 1 and 20 inclusive, it outputs i. And on any other input whatsoever, it outputs X. What software S actually does is, on input i, where i is a natural number between 1 and 19 inclusive, it outputs i. When input 20, it outputs 3. And on any other input whatsoever, it outputs X. So S is reliable – it does what is wanted – on all inputs except 20. And, executing on input 20, pardon me for saying so, it fails. That failure has a cause, and that cause or causes lie somehow in the logic of the software, which is why IEC 61508 calls software failures “systematic”. And that cause or causes is invariant with S: if you are executing S, they are present, and just the same as they are during any other execution of S.
But the reliability of S, namely how often, or how many times in so many demands, S fails, depends obviously on how many times, how often, you give it “20″ as input. If you always give is “20″, S’s reliability is 0%. If you never give it “20″, S’s reliability is 100%. And you can, by feeding it “20″ proportionately, make that any percentage you like between 0% and 100%. The reliability of S is obviously dependent on the distribution of inputs. And it is equally obviously not functionally dependent on the fault(s) = the internal causes of the failure behavior, because that/those remain constant. Ratio's ... as commonly applied ... often violate the higher law: "Do good; avoid evil"
% Complete is a ratio, numerator/denominator. The big issue is with the denominator. The denominator, which is supposed to represent the effort required, is really dynamic and not static, and thus requires update when you replan or re-estimate -- something that almost never happens, thus consigning the denominator to irrelevance.